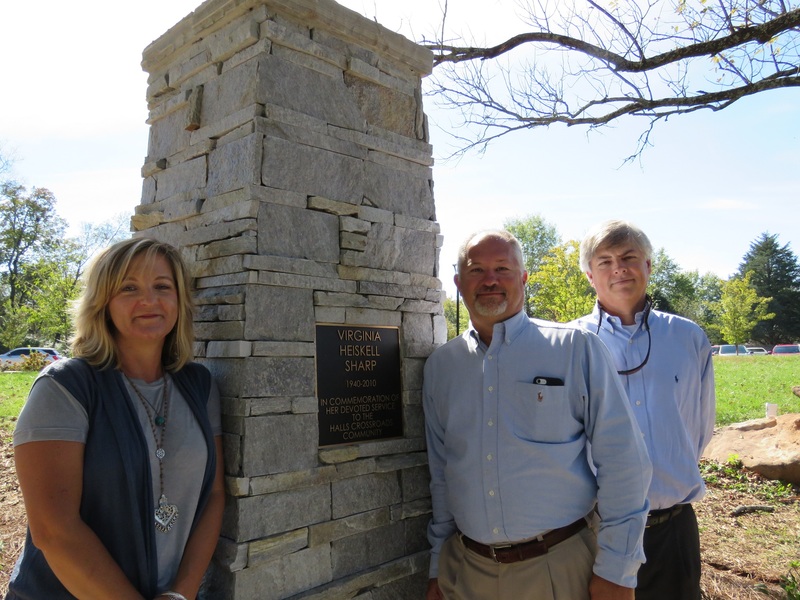 The children of David and Virginia Heiskell Sharp: Jennifer Gaylor, John Sharp, Jeff Sharp. 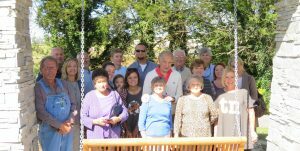 The late Virginia Heiskell Sharp was remembered Friday by family and friends who gathered in Clayton Park to dedicate a special swing in her memory. Mary Carroll, president of the Halls Crossroads Women’s League, presided and Danny Gaylor offered a prayer. More than a dozen members of the Women’s League wore bright red golf shirts. Many shared memories of Mrs. Sharp, who died in 2010 at age 70. “She loved her family,” said Carroll. David Sharp called it “a great day and a difficult day” and said he was blessed to have been married to Virginia for 51 years. He talked about her volunteer work with the women’s league and how she pushed him to do more. Knox County Commissioner Michele Carringer praised Virginia’s competitive spirit, whether in bridge or golf, she played to win. “She was determined to finish the Thomas Hall Cemetery,” said former women’s league president Shelba Murphy. “We will remember her for that project.” Mrs. Sharp led efforts to restore gravestones and to fence the burial place of the founder of Halls, Thomas Hall, on Rifle Range Road. The family gathered for a picture and the group disbursed. Members of the women’s league were out on Saturday morning picking up trash. And at 1 p.m. they were meeting at Clayton Park to plant jonquils around the flag pole and the new swing. The work continues. Members of the Heiskell and Sharp families are pictured with the swing in Clayton Park.